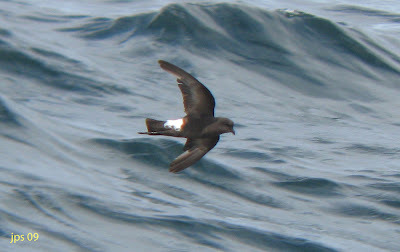 Leach's Storm-petrels provided yet another exciting element the BBC Extreme Pelagic on July 18th with good numbers (58 logged) being recorded throughout the warmer waters along the shelf edge. 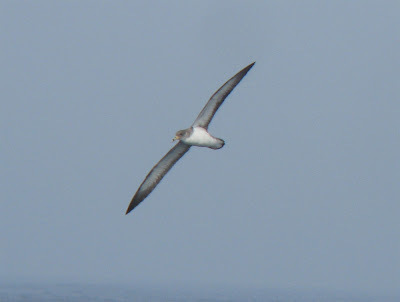 Most of the extreme pelagics that I've been on have produced one to three Leach's, but this particular day produced several small flocks composed entirely of this species! 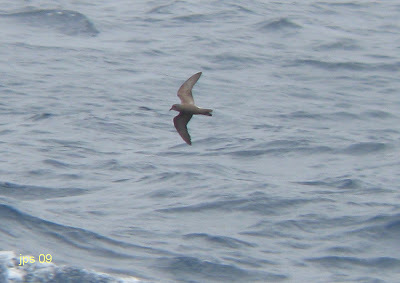 As with other storm-petrels, views were often fleeting but occasionally good. 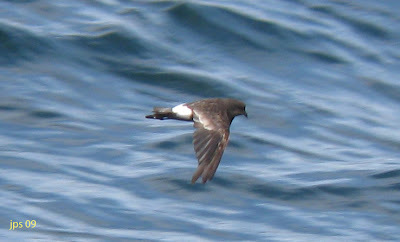 Wilson's Storm-petrel. Seen throughout the day with close to 500 being recorded. 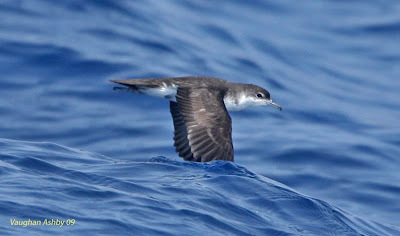 The BBC Extreme Pelagic on July 18th produced a Massachusetts record tally of Audubon's Shearwaters with 19 being logged in the warmer shelf waters well south of Nantucket. Views were generally good though not quite as satisfying as on other BBC pelagics to this area, perhaps due to the rougher sea conditions. This heavily molting bird (featured in the first three shots here) was the only one that came reasonably close to the boat. 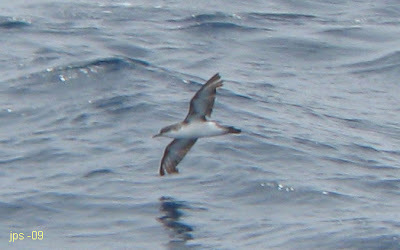 Aududon's Shearwater. Fifteen miles NW of West Atlantis Canyon, MA. 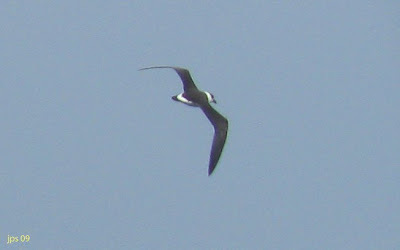 First Audubon's of the day rising well above the horizon followed just seconds later by a stunning Black-capped Petrel! 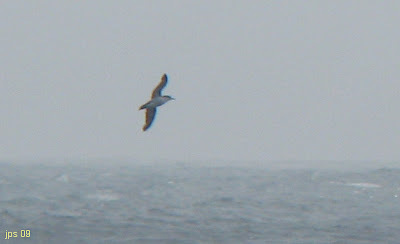 Greater Shearwater - About 240 seen during the day. 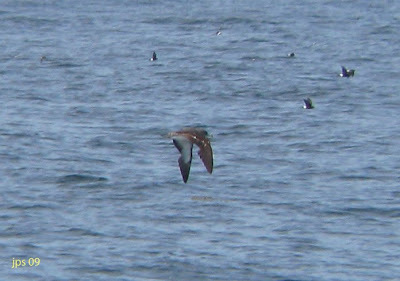 Cory's Shearwaters. The official count for the day tallied 232 birds though I must confess that it seemed like more at the time. Many were seen well and all/most, like the birds in these shots, resembled C.d. borealis with no strong candidates for C.d.diomedia, despite some diligent checking. 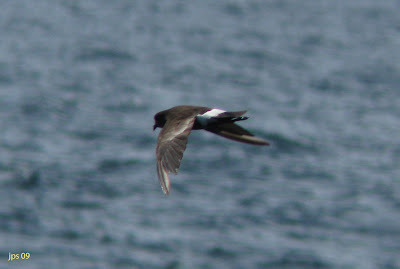 Wilson's Storm-petrel. Jeffreys Ledge, NH. July 22nd, 2009. Susannah, Matan and I took the afternoon boat to Jeffreys Ledge with the Granite State Whale Watch from Rye Harbor. Although a little choppy going out, it turned out to be a beautiful calm afternoon on the ocean with 'tubenoses' in good numbers once we arrived at Jeffreys Ledge. We didn't encounter any rarities but the proximity of some very close shearwaters and storm-petrels made the trip completely worthwhile. 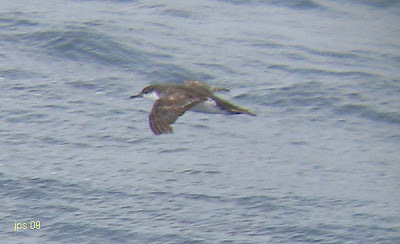 These included some of the best views that I've had of Sooty Shearwaters in the Atlantic. The whale show was equally impressive with about 6 Fin, 2 Humpback and 2 Minke Whales seen during the afternoon. 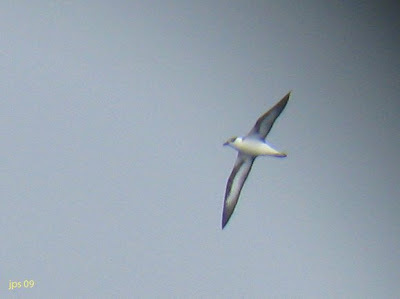 A few Northern Gannets and a couple of distant, unidentified jaegers were the only other birds of note. 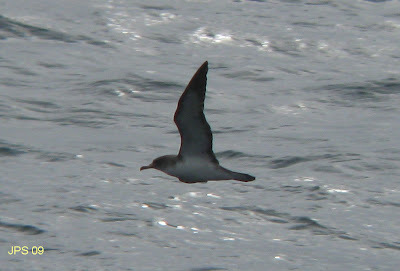 Cory's Shearwater - 5 (including 3 borealis). 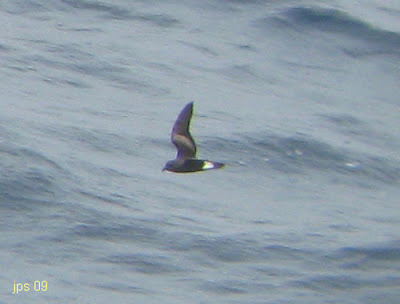 Wilson's Storm-petrel - c.800 (some very nice rafts at Jeffreys Ledge). 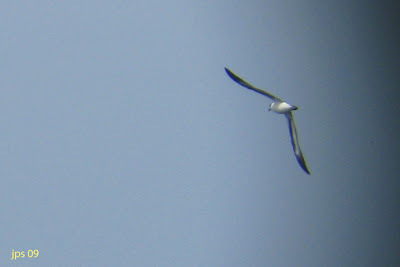 All of the following are 'digi-binned' images taken using a Canon Powershot A590 handheld to Leica 8x42 binoculars. 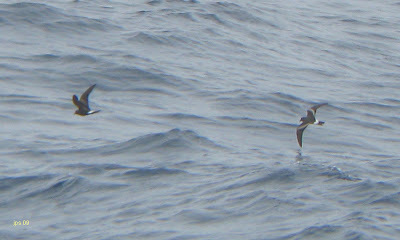 Wilson's Storm-petrels. Jeffreys Ledge, NH. July 22nd, 2009. 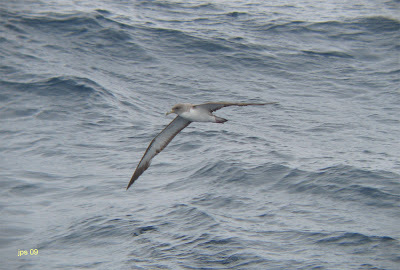 Cory's Shearwater.C.b. borealis. Shows nice contrast between white underwing coverts and dark underside of primaries. Jeffreys Ledge, NH. July 22nd, 2009. 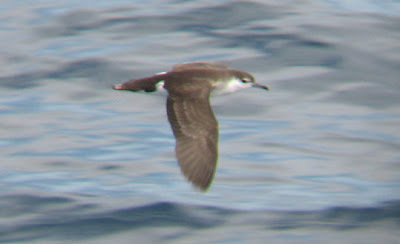 Cory's Shearwater.C. borealis. Although relatively close to the boat this bird flew directly away from us, frustratingly eluding a sub-specific identification. Jeffreys Ledge, NH. July 22nd, 2009. 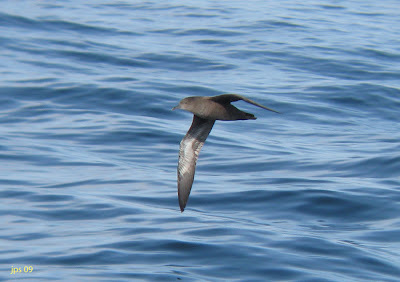 Sooty Shearwaters. Wonderful views in excellent light. Jeffreys Ledge, NH. July 22nd, 2009. 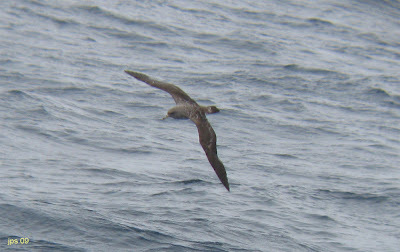 Greater Shearwaters. Jeffreys Ledge, NH. July 22nd, 2009. Northern Gannet. Jeffreys Ledge, NH. July 22nd, 2009. 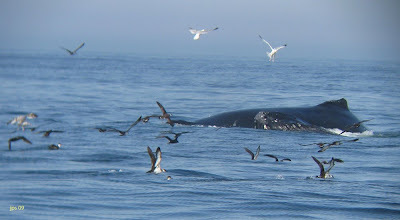 Greater and Sooty Shearwaters feeding around Humpback Whale. Jeffreys Ledge, NH. July 22nd, 2009. Fin Whale - Vicinty of Jeffreys Ledge, NH. July 22nd, 2009. 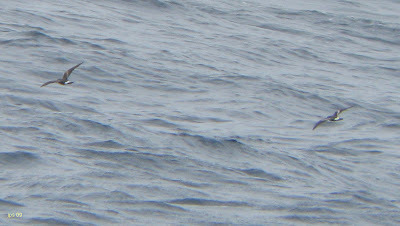 Black-capped Petrel Pterodroma hasitata. 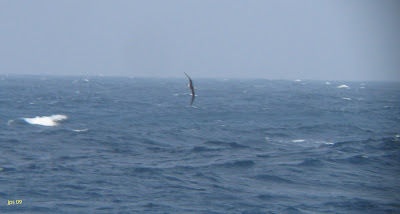 Found on the July 18th BBC Extreme Pelagic at around 10:50am, North-west of West Atlantis Canyon, MA. About the fifth state record. Digibin images taken using Canon Powershot A590 hand held to Leica 8x42 binoculars. Just a reminder that you can view any of these images at a larger size with a single click on the image. 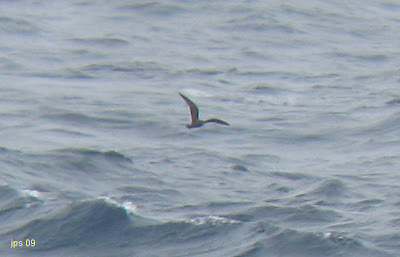 This bird was just one element of an excellent bird-rich adventure at sea. Overall, it was one of the better (or maybe even the best!) BBC Extreme pelagics that I've been on. 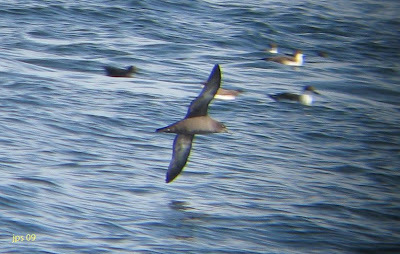 Aside from the Black-capped Petrel, we had a fabulous display of Cory's Shearwaters, a state record count of Audubon's Shearwaters and a super showing of Leach's Storm-petrels. 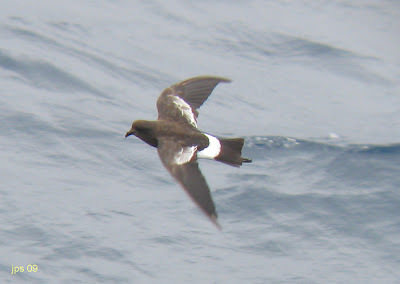 The latter, at times, offered some exquisite direct comparisons with Wilson's Storm-petrels. On the down side, we could only find one jaeger all day - a dark-morph, sub-adult Pomarine and I had two possible Band-rumped Storm-petrels leaving a flock of resting Leach's Storm-petrels which were quickly lost to view behind the bow of the boat before I had a chance to call them. A North Atlantic Right Whale sadly entangled in fishing gear provided the most sobering sight of the day. Special thanks to Ida Giriunas for making these trips happen, and to the leaders, Rick Heil, Jeremiah Trimble and Steve Mirick. Rick Heil's constant vigil at the front of the boat has to be seen to be believed! Also, a special word of thanks to travel and field companion Nick Bonomo who managed to grab a last-minute opening on the trip and couldn't have been more pleased with his decision to come along! 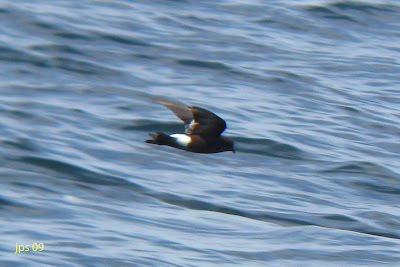 A complete, detailed post of the day's events by Rick Heil can be found here on Seabird News; Steve Mirick has put together a map of the route taken on the trip; excellent photos of the Black-capped Petrel and other species from the day can be seen in Jeremiah Trimble's photostream; and a nice account of the trip along with a map of the Black-capped Petrel's location can be found on Nick Bonomo's Shorebirder blog. 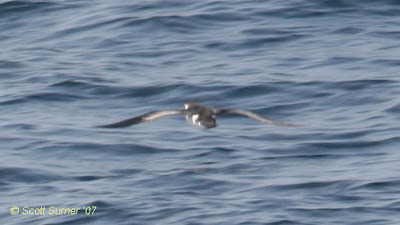 Black-capped Petrel Pterodroma hasitata. 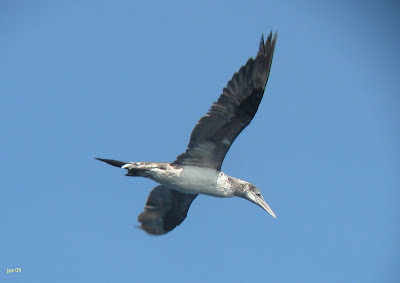 Initially discovered during attempts to relocate the first Audubon's Shearwater of the day which had been found just seconds earlier by Derek Lovitch. 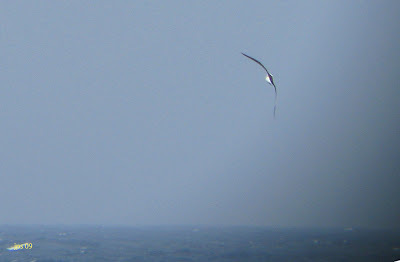 The bird made relatively close pass of the boat before gliding away at speed. 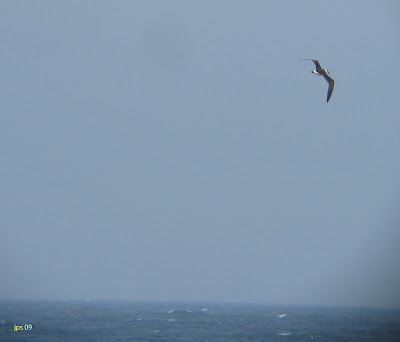 Remarkably, Captain Joe Huckameyer managed to chase the bird down before it gave a second, even closer pass about four minutes after the first observation, thus allowing just about everyone on board to catch up with this most exciting pterodroma. Boyd's Sheawater Puffinus boydi - Cape Verde Islands, March 2009. Vaughan Ashby. 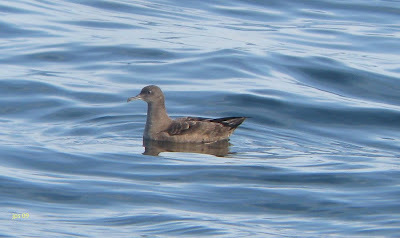 With the forthcoming Brookline Bird Club Extreme Pelagic scheduled for July 18th, this week seems like a good time to reflect on the possible species, especially within the small black-and-white shearwaters group. 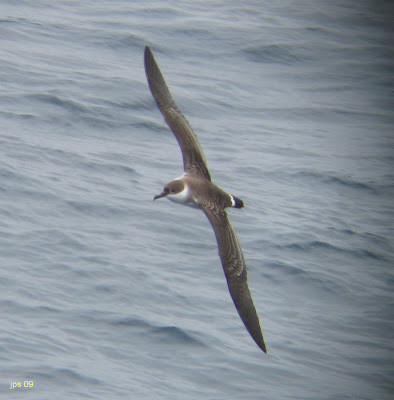 Recent BBC pelagics have recorded Audubon's with some regularity in the deeper warmer waters off Massachusetts. 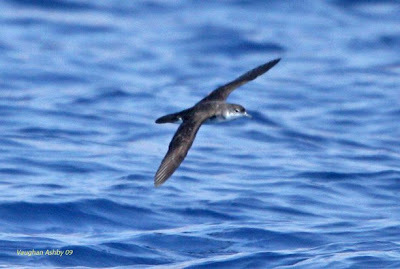 It could even be described as 'expected' on the July and August pelagic trips. 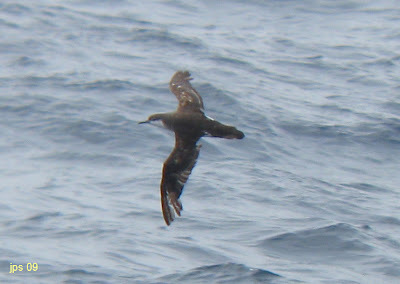 Of course, the well documented Barolo's Shearwater (aka Macaronesian or Little Shearwater) on August 25th, 2007 was a huge find and opened up the pathway to the more extreme possibilities from further afield - Barolo's closest known breeding range is in the Azores. 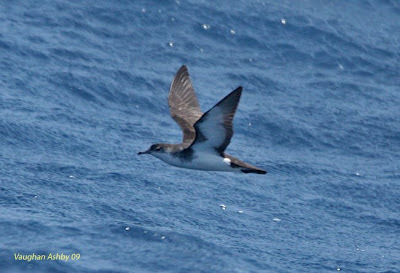 When Vaughan Ashby sent me some images of Boyd's Shearwaters (aka Cape Verde Little Shearwater) taken in March 2009, I was truly taken aback by their close resemblence to Audubon's Shearwater - indeed boydi was included as a form of Audubon's in the recently published 'Albatrosses, Petrels & Shearwaters of the World' by Onley and Schofield (2007). Boyd's appears to share the 'long-tailed' appearance of Audubon's with similarly dark longest undertail coverts. 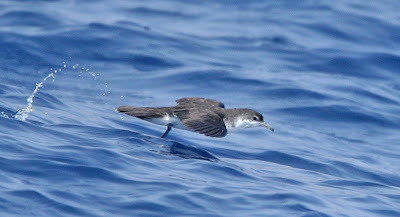 Very little information appears to exist on actual plumage features separating Audubon's and Boyd's Shearwaters and looking at Vaughan Ashby's images from the Cape Verde Islands, I'm not surprised! The most consistently cited difference appears to be leg color; pink or flesh in Audubon's and notably pale (powder) blue in Boyd's. 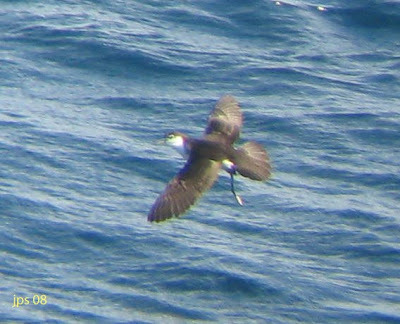 Difficulties in ascertaining an accurate definition of leg color at sea are well known but even so, I think it may be possible on some well photographed birds. Flesh-pink legs show up well on some images of Audubon's taken off MA. Barolo's has pale blue legs and feet, but is smaller, more compact with largely white undertail coverts, striking white tips to the upperwing coverts forming wing-bars, and often shows white of the face completely surrounding the black beady eye. These features show up so well in Scott Surner's fine images taken of the MA bird on 08/25/07 and it seems unlikely that such well marked birds would be confused with Boyd's. Having looked at Vaughan Ashby's images, and poured over the images and plates in the recently published 'Petrels Night and Day - The Sound Approach' by Robb & Mullarney (2008), one has to wonder if Boyd's Shearwater is a bird that's been overlooked in the past off coastal MA? If it hasn't, it must surely be listed as species that might occur in future? 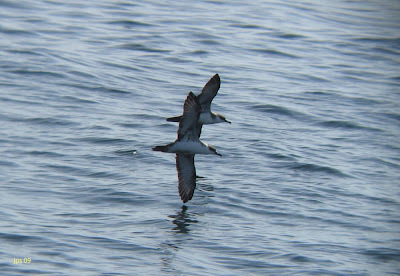 I'd be very interested to receive comments from birders who have first-hand field experience of both Boyd's and Audubon's Shearwaters, and to know if they've have any comments on how to separate them. 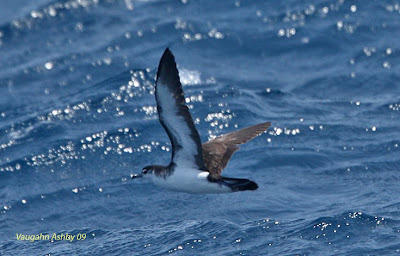 Thanks: I'm extremely grateful to Vaughan Ashby, Director of Birdfinders, for allowing me to post his excellent images of Boyd's Shearwater taken in the Cape Verde Islands in March 2009. You can find out more about that trip by clicking here. 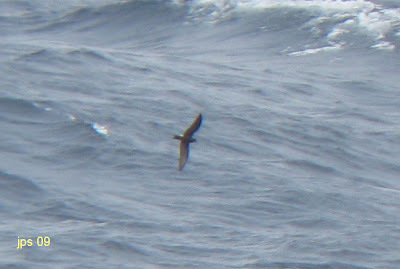 Note 1: I've followed the species names adopted by Robb & Mullarney in 'Petrels Night and Day', 2008. The authors indicate that these names will also be used by other authors on this subject in the future. 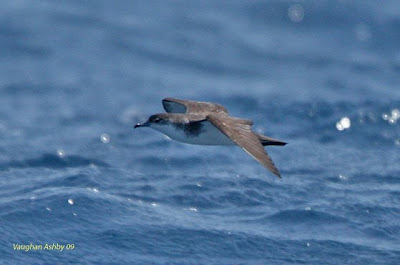 Note 2: A very interesting discussion on the Identifcation of Boyd's and Audubon's Shearwaters can be found be found here on the excellent oceanwanderers website. 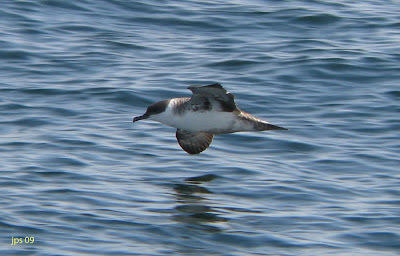 Note 3: More discussion on black and white shearwaters from the ID Frontiers Archives, including reference to one of the Audubon's Shearwaters featured here from 2007. Boyd's Sheawater Puffinus boydi - Cape Verde Islands, March 2009. Vaughan Ashby. Very similar to Audubon's in overall appearance, but the bluish legs and feet can be made out in this shot. 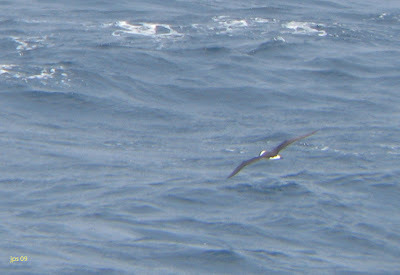 Audubon's Shearwater Puffinus Ilherminieri - Veatch's Canyon, MA. August 23rd, 2008. Here the outerside of the legs look blackish but the webbing between the toes appears distinctly pink. Boyd's Sheawater Puffinus boydi - Cape Verde Islands, March 2009. Vaughan Ashby. On views like this, would this bird be seperable from Audubon's? Barolo's Shearwater Puffinus baroli - North of Veatch's Canyon, MA. August 25th, 2007. Scott Surner. 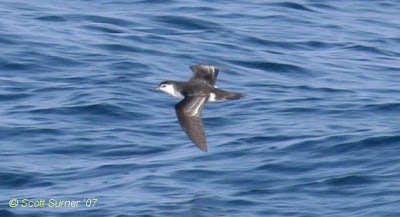 Small, compact, black-and-white shearwater looking strikingly white faced, and in this case, showing striking white wing-bars. Exactly the sort of views and images that one would hope for when stumbling across a 'mega'. 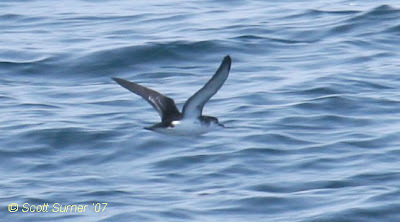 Audubon's Shearwater Puffinus Ilherminieri - Hydrographer Canyon area, MA. August 19th, 2007. This bird had a heavily abraded tail giving it a short-tailed impression. The undersides of the pinkish feet can be seen projecting beyond the tail. 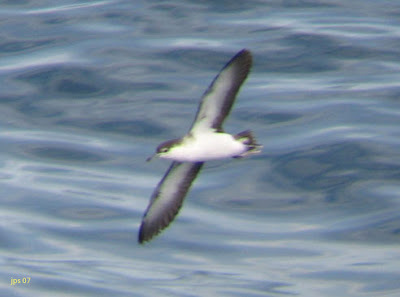 Audubon's Shearwater Puffinus Ilherminieri - Hydrographer Canyon area, MA. August 19th, 2007. Same bird as above. 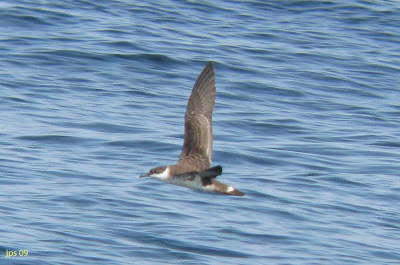 Audubon's Shearwater Puffinus Ilherminieri - Hydrographer Canyon area, MA. August 19th, 2007. 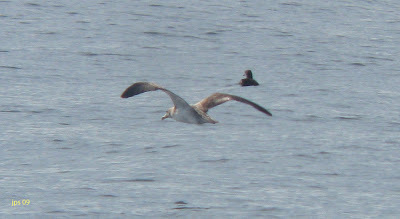 Same bird as above with a heavily abraded tail giving it a shorter tailed impression. Although just a digibin shot, the pinkish legs and feet can be seen reasonably well. 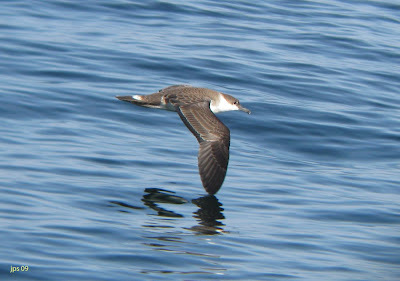 Audubon's Shearwater Puffinus Ilherminieri. Hydrogrpaher Canyon area, August 19th, 2007. 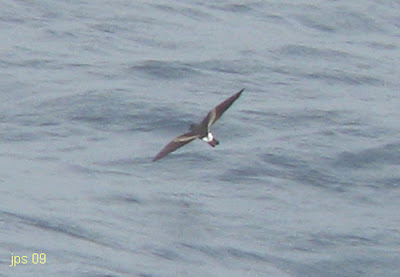 Gliding low over the sea looking typically long tailed and long necked when compared to Manx and Barolo's. Boyd's Sheawater Puffinus boydi - Cape Verde Islands, March 2009. Vaughan Ashby. 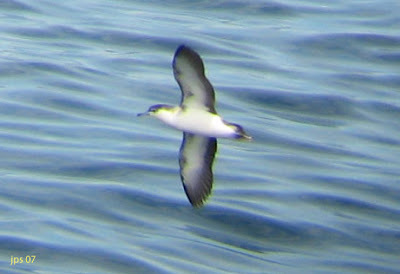 Apart from the blue-gray legs, very similar to Audubon's though perhaps appearing a little smaller and more petite. Barolo's Shearwater Puffinus baroli - North of Veatch's Canyon, MA. August 25th, 2007. Another amazing shot by Scott Surner showing the white upperwing bars and large expanse of white on the underwing. Barolo's Shearwater Puffinus baroli - North of Veatch's Canyon, MA. August 25th, 2007. Scott Surner. Another wonderful image, this time a shot of the oft-quoted slivery panel across the middle of the upperwing. Apparently, this feature can be seen well at range.